I recently received a LinkedIn invite from one Ferdinando Buscema, who described himself to me as a Glasperlenspieler, a player of the Glass Bead Game. I must say that pleased me, there’s a quiet humility there that calling oneself Magister Ludi or Master of the Game would lack. He’s a player, I’m a player, let’s play. Not for nothing does Ferdinando call himself a Magic Experience Designer. As you’ll see, in the video Ferdinando very warmly recommends Erik Davis‘ book TechGnosis: Myth, Magic & Mysticism in the Age of Information — which has also been highly praised by the likes of Howard Rheingold, Hakim Bey, Mark Dery, Bruce Sterling, Terence Mckenna, and Mark Pesce, to which intriguing list you may add myself. Erik and I began a never-completed HipBone game many years ago — it was around the topics of Hanibal Lecter, his recreational collection of church collapses, and the origins of the Memory Palace in Simonides‘ encounter with the gods Castor and Pollux — and Erik mentions the HipBone Games briefly in his book. At the moment, I owe him an update on the games, which I’ll post here at Zenpundit in due course. It was a particular delight for me, then, to see Ferdinando’s obvious and full-throated praise of Erik’s stunning book in his video, followed up by equal praise of Ramon Llul — one of those writers in the Hermetic tradition whose work precedes not just the Bead Game but much of today’s science, from digital computers via genetics to genetic algorithms and cryptography. 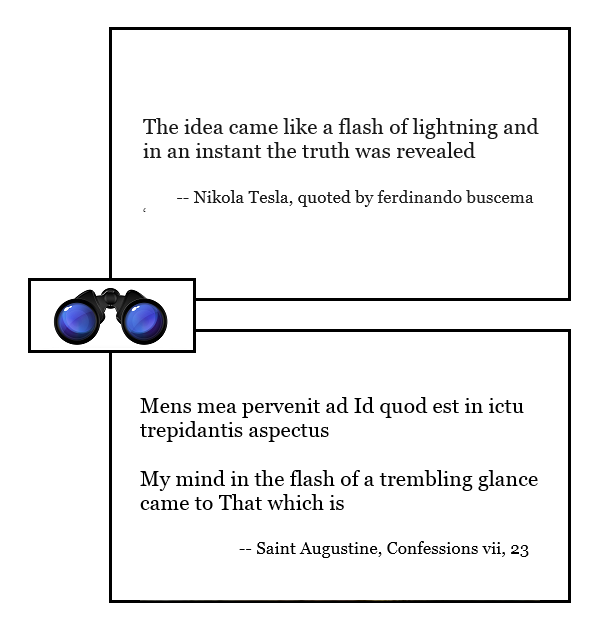 Ferdinando’s third treasure turned out to be Nikola Tesla, and in particular the remark he made about his mode of creativity. I hadn’t come across this remark before, but it cried out for DoubleQuotation with a remark of St Augustine’s, which I have carried with me since I first read of it in Dom Cuthbert Butler‘s book, Western Mysticism, back in my teens better than half a century ago. It doesn’t hurt, of course, that the word “ictus” which Augustine uses also features in the context of Gregorian Chant, where it indicates the almost simmultaneous touchdown of a bird on a branch and its takeoff on a new curve of flight. I had the honor to learn the word from Dom Joseph Gajard, choirmaster at the Abbey of St Pierre de Solesmes — then and I suspect now the center of the world’s musical paleography and liturgical perormance of the chant, and in my teens my favorite vacation and retreat — under whose cheironomic hand I had the good fortune, once, albeit without much skill, to sing..
And so the beads are dropped into the lake: we watch as their ripples ripple out and intersect.. This entry was posted on Sunday, January 25th, 2015 at 6:04 pm	and is filed under Charles Cameron, Doublequotes, Glass Bead Game, Hipbone Games, literature, magic, music, myth, recommended reading, Rheingold, sunday surprise, Uncategorized, youtube. You can follow any responses to this entry through the RSS 2.0 feed. Both comments and pings are currently closed.